The MK 41 Vertical Launching System (VLS) is the worldwide standard in shipborne missile launching systems. Under the guidance of the US Navy, Martin Marietta performs the design, development, production, and field support that make the battle-proven VLS the most advanced shipborne missile launching system in the world. The Mk 41 VLS simultaneously supports multiple warfighting capabilities, including antiair warfare, antisubmarine warfare, ship self-defense, strike warfare, and antisurface warfare. MK 41 is a fixed, vertical, multi-missile storage and firing system that lets Navy vessels launch significant firepower. 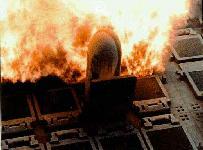 The capability of VLS to simultaneously prepare one missile in each half of a launcher module allows for fast reaction to multiple threats with concentrated, continuous firepower. The Mark 21 VLS launch canister for the SM-2 Block IV round and its variants, and the Mark 14 canister for the Tomahawk land attack missile (TLAM) cannot be transferred at sea. They are several thousand pounds too heavy for the existing handling crane. A US Navy warship that runs out of SM-2 Block IVA, SM-2/LEAP or TLAM missiles has to break off its patrol and proceed to port to reload. In Fiscal Year 1996 the US Navy started work on the Concentric Canister Launcher (CCL), a universal launch system able to handle the Tomahawk, SM-2 Block IV and Evolved Seasparrow Missile (ESSM). Designed to be capable of simultaneous and co-ordinated launch of multiple missile types, the CCL will be a modular automated design compatible with reduced manning levels. The US Navy currently deploys MK 41 VLS - on AEGIS-equipped Ticonderoga-class cruisers and Spruance- and Arleigh Burke-class destroyers - and plans to use it on next generation of surface ships, the LDP17, DD-21 and CG-21. In production since 1982, VLS is continually upgraded to incorporate new technology and integrate new missiles. Additionally, MK 41 VLS is the choice of eight other international navies - including Canada, Japan, Germany, Turkey, Spain, Netherlands, Australia and New Zealand - a number that is expected to grow as a result of significant ongoing international marketing campaigns. The Vertical Launching System (VLS) Mk 41 is a canister launching system which provides a rapid-fire launch capability against hostile threats. The missile launcher consists of a single eight-cell missile module, capable of launching SEASPARROW missiles used against hostile aircraft, missiles and surface units. Primary units of the VLS are two Launch Control Units, one 8-Cell Module, one 8-Cell System Module, a Remote Launch Enable Panel and a Status Panel. The Launch Control Units receive launch orders from the Multi-Function Computer Plant (MFCP). In response to the orders, the Launch Control Units select and issue prelaunch and launch commands to the selected missile in the VLS launcher. During normal VLS operations, each Launch Control Unit controls half of the Launch Sequencers in the launcher. Either Launch Control Unit can be ordered by the MFCP where one Launch Control Unit is offline and the other Launch Control Unit assumes control of all Launch Sequencers in the launcher. The 8-Cell Module consists of an upright structure that provides vertical storage space for eight missile canisters. A deck and hatch assembly at the top of the module protects the missile canisters during storage and the hatches open to permit missile launches. The plenum and uptake structure capture and vent missile exhaust gases vertically up through the module to the atmosphere through the uptake hatch. Electronic equipment mounted on the 8-Cell Module monitors the stored missile canisters and the module components and assists in launching the missiles. The 8-Cell System Module is like an 8-Cell Module with addition of the 60 Hz and 400 Hz Power Distribution Panels; the Damage Control Junction Box; the System Lighting, Power Receptacle, and Telephone Junction Box; and the System Transformer Platform that serve the entire launcher. The 8-Cell System Module receives and distributes power and control signals from outside the launcher to all the modules and collects control and damage control signals from the modules and sends them outside the launcher. The Status Panel receives module status and launcher hazard signals from the monitoring assemblies within the launcher. Status and hazard conditions are displayed on the Status Panel. The Status Panel also sends launcher hazard and module status signals to the ship Central Control Station. The Status Panel receives enable signals from the Remote Launch Enable Panel that enables launcher power and the launch enable function within the launcher if the Status Panel is in remote operation. The modular MK 41 is adaptable to short-length configurations to enhance ship and weapon applicability potential worldwide. Responding to continued development interest from US Navy allies, the USN is pursuing a VLS MK 41 tactical-length launcher initiative to provide for shipboard loadout and rapid firing of existing Antiaircraft Warfare (AAW) and Antisubmarine Warfare (ASW) tactical weapon types, and allow significant expansion in alternate ship mounting arrangements (such as in superstructure areas) and for reduced draft hulls. The engineering development for the tactical-length launcher has been completed. The tactical-length launcher uses the vast majority of the strike-length VLS MK 41 components and remains an eight-cell module with full VLS MK 41 system capability. A new modernization plan for surface combatants would decommission some ships early, but would boost the firepower of the remaining force by adding the Vertical Launch System (VLS). The five TICONDEROGA-class cruisers in the fleet without VLS would receive the system: USS TICONDEROGA (CG 47), USS YORKTOWN (CG 48), USS VINCENNES (CG 49), USS VALLEY FORCE (CG 50) and USS THOMAS GATES (CG 51). 1 Canister Adapter required between plenum structure and canisters for Mk 41 strike launchers. 2 STANDARD Missile-2 Block IVA for Theater Missile Defense (TMD) and STANDARD Missile-3 for TBMD, in development.